...in a 2-pack with Scotty. The Rundown: Time to take another look at one of the DST crew reissues- Spock! 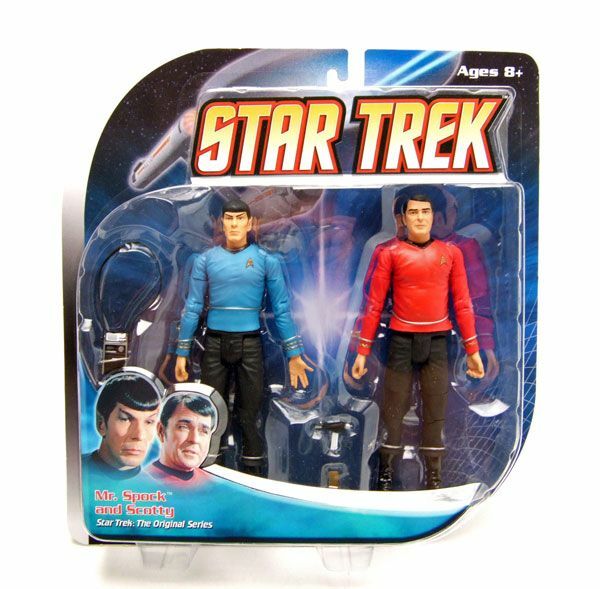 Both the single-carded and 2-pack versions of Spock are pretty close in appearance, but are they different enough from the first release (spotlighted here) to warrant a purchase? Take a look! 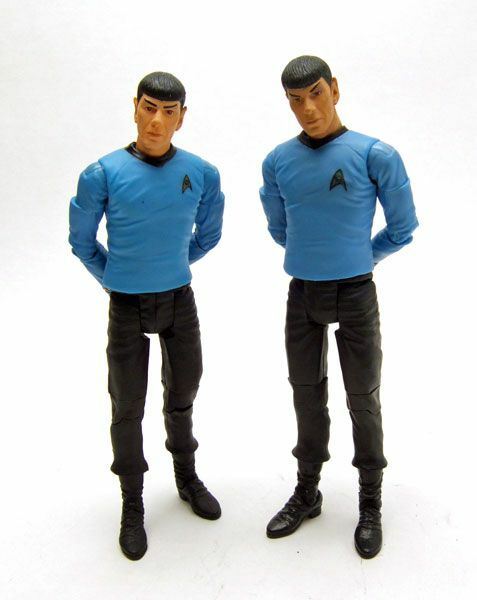 The reissue Spock uses the same body as the original, so you're looking at the same great likeness and articulation here. Yeah, he's still got a rubbery shirt. I REALLY wish DST had given the reissues solid torso sculpts instead, but what can you do. 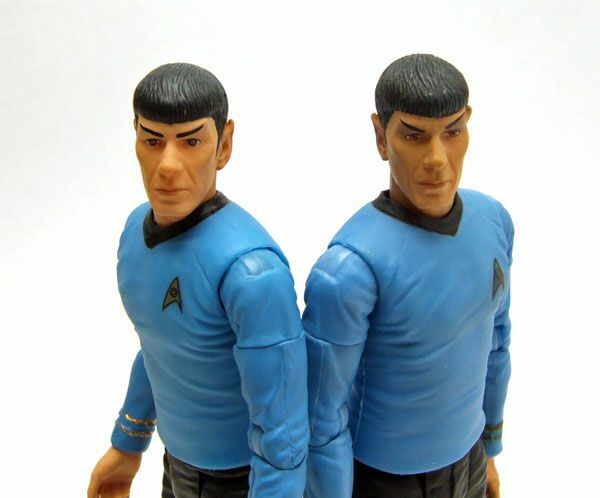 Spock has been given a lighter skin tone on the reissue than he had on his original release. I can't really decide which one I prefer and I really don't feel one stands out as being better than the other, so I'm going to leave this one up to your own personal preference. While taking the pics I noticed that this reissue Spock (which is actually the single-carded version) had some "puppy dog eyes" going on. When I looked at the 2-pack version, I realized the eyes looked a bit better on him. Not sure if it's that way on all the releases, but it may be something to watch out for. ...and in the rank braids. It's a really big improvement over the original, which now has a greenish hue. 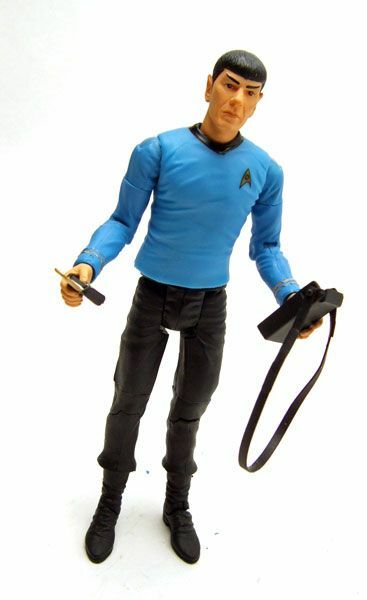 Accessories: The single-carded Spock includes a tricorder, communicator, phaser, and 2 interchangeable hands. 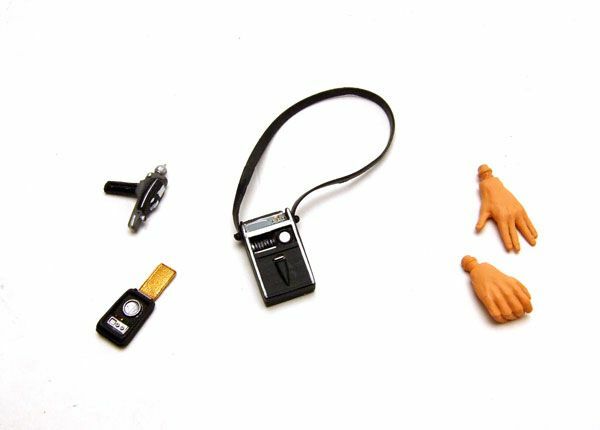 The 2-pack version includes the same equipment but lacks the interchangeable hands. 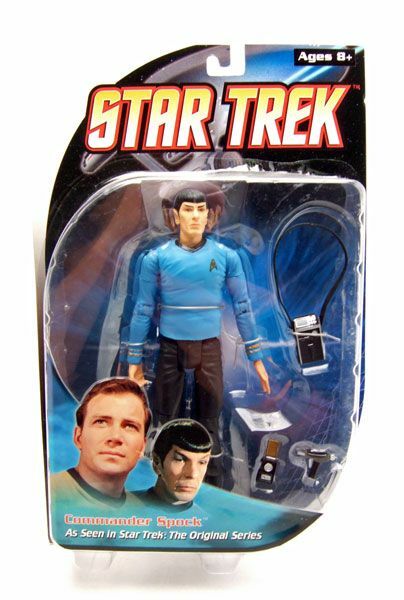 Unfortunately, he's sporting the "live long and prosper" hand in the 2-pack, making his left hand pretty much useless. Thanks for the review. Based only on the photos above, I think I like the original's eyes better. Happy New Year. Fantastic review, this actually made me want the originals again rather than the re-issues due to your pics but I'm not really that fond of the re-releases. to me they look quite weak in the paint department and what i've noticed is that what was a decent sculpt by Art Asylum has been lost somewhat with the paint application from DST - take the ranks - AA have painted them with precision going over each of the little sculpted braids. DST seem to have just painted a gold line over the sculpt which seems sloppy. Also i really don't like the new head paint it looks too much like an animated version of Spock rather than a realistic portrayal . The hair, eyes and skin tone are all too thick too and are one block colour it seems where as there's a lot more tones in the AA version. Also whilst these figures might not be leaving black on the necks or having the paint on the gold wear off these are just out of the factory compared to the nearly 9 year old AA versions. Still plenty of time for the DST versions to fade i feel. 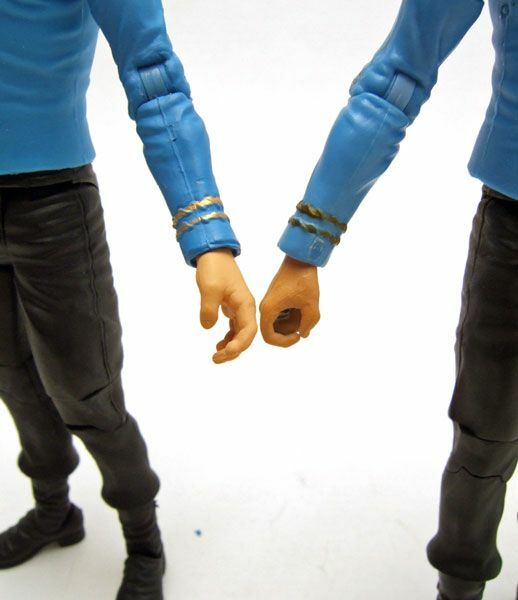 I'm not sure who to ask about this, but you seem like an expert on Trek toys-- since it doesn't seem like Diamond is going to release a regular Chekov figure in the near future, I was considering buying a Mirror Chekov and popping his head (an d possibly arms) onto a spare Kirk figure I have. Do you know any sites that offer instructions on how to do this? Thanks for the compliment! Glad you're enjoying it! Switching heads is incredibly easy, but arms are going to be TOUGH. You'd be better off using a very fine grade sandpaper and just taking the rank braids off the sleeves. I would probably go with a Sulu, as the build is a bit closer and there's only 1 rank braid to worry about, but a Kirk could work too. To switch heads, you'll need to boil up some water (either in your microwave or on a stove). Once it's boiling, remove it from the heat source and dip the the figures head and shoulder area into the water (so that the water covers the entire neck region). Hold it in there for around 60 seconds or so. The heat of the water should soften the plastic enough that the head will pop right off of the neck post. You can then pop the head right onto the other body (if you take too long popping them off, you may need to soften the disembodied heads up a bit before popping them back onto the new bodies). Hope that helps! Quick update-- it totally worked! I spent the better part of 5 minutes the other night trying to use brute force to pull off Kirk's head to no avail. Right after trying your method, the head popped off without any effort at all. Really cool! I just put in an order for a Mirror Chekov. 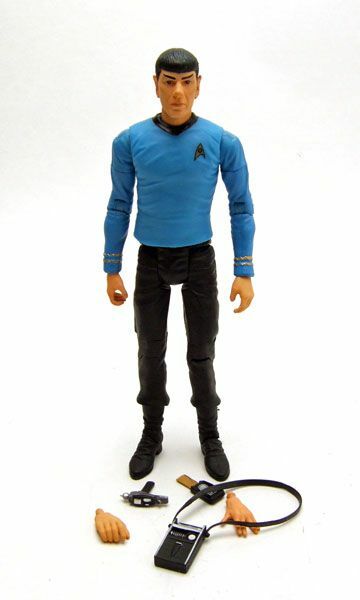 The reason I'm not using Sulu-- I can find a older "regular" Chekov figure by Art Asylum but it's about $40, which is more than I'm willing to spend on a single figure (especially since Chekov's my least favorite of the original 7; still like him, but don't love him). 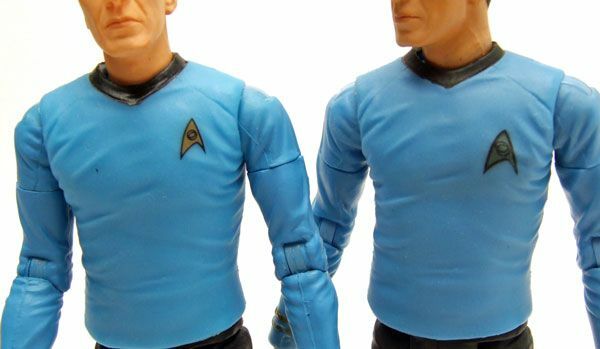 If I had to buy both a Sulu and a Chekov, it puts me pretty close to $40 anyway, so what would be the point of customizing (other than the color is slightly different, as you pointed out in an older blog)? Besides, I already had a spare Kirk from when I bought the single carded figure and then bought the two-pack to get Uhura-- so it makes sense to pay a mere $15 to get the Mirror Chekov and swap his head onto the spare Kirk I have. Regarding hands, I'm not as concerned about the rank thing, but am concerned the skin color on the hands won't match the skin on the head. However, I'm willing to live with it if it saves me $25 plus shipping on buying the Art Asylum version. Plus, you know I'm scoop up a Diamond Chekov if they ever do one. 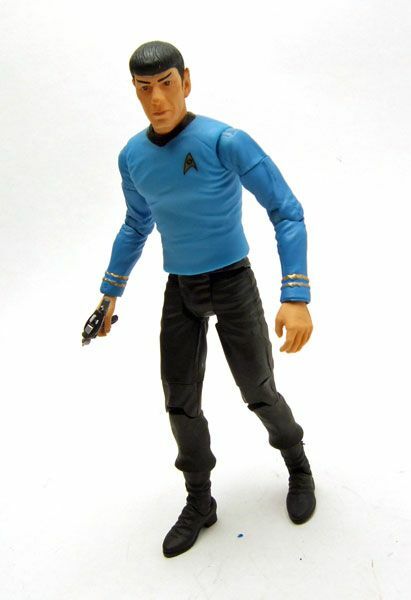 FYI-- I noticed a good amount of black markings around Kirk's neck after the head came off, so it seems the black on the necks are going to be a problem for DST figures as they were for AA's figures.